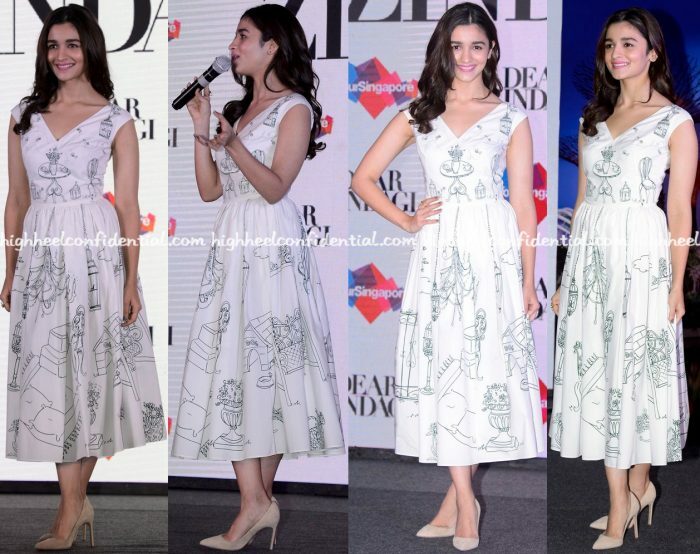 During the course of movie promotions, Alia was photographed in a Dolce & Gabbana dress. Wearing it with wavy hair and a pink lip, the actor rounded out the look with a pair of Manolo Blahnik pumps. Wish she had gone all out and picked a pair of white pumps, or at the very least a pair of soft dove grey ones. The light beige ones she had on… Neither here, nor there really. But that minor, minor gripe aside, she looked nice; the dress was a great pick for her! For her travel, Alia once again opted for basics (tee and denims) paired with a long jacket. Like how she wears her Lulu And Sky parka? Another day, another round of promotions. And for her latest appearance, Alia picked a Lavish Alice jumpsuit. Top knot in place, Ms. Bhatt finished out her look with a vibrant red lip and pair of oxblood sandals. She looked good!